CHELSEA, Mass. — You wouldn’t think on the face of it that Lisa D’Amour, the hip New York writer (via New Orleans) would have that much in common with the 1940s-‘50s depressive Midwest playwright William Inge. But seeing D’Amour’s “Detroit” at the Apollinaire Theatre Company and “Come Back, Little Sheba” at the Huntington Theatre Company on back-to-back days, made it apparent that D’Amour is part of the great thematic through line of American theater that began with Eugene O’Neill and the Provincetown Players and runs through Arthur Miller, Inge, Edward Albee, Sam Shepard and D’Amour. “Detroit” (at Chelsea Theatre Works) is not set in the Motor City and there’s not a car in sight or a Motown song on the soundtrack. Instead we’re in a cramped suburban backyard shared by Mary and Ben (Becca A. Lewis and Stephen Libby) and Sharon and Kenny (Courtland Jones and John Dylan Greene). Detroit's economic devastation is symbolic of their lives, as, on a more comedic level, the screen door that gets stuck on its track. And while the actors are a delightful quartet, if the characters they play were to invite you over for a barbecue, you might want to think twice. Mary and Ben are a middle-class couple trying to play by the rules. Sharon and Kenny pay lip service to coloring between the lines, but you know it’s not going to take long for their self-admitted trailer-trash ways to come to the fore. This kind of civilization and its discontents theme is a tried and true one in late 20th and early 21st century theater and, for that matter, film. Those questions are what tie “Detroit” and “Come Back, Little Sheba” (at the Roberts Theatre at the Boston Center for the Arts) together. There are remarkable arias in both plays, by Becca Lewis’s Mary in “Detroit” and Derek Hasenstab’s Doc in another, where all the pent-up frustrations of trying to behave responsibly overwhelm them. Doc has tried to keep his lust for liquor and his libido in line by living a well-ordered life, tamping down his dissatisfactions with a foolish wife (Adrianne Krstansky) and his yearning for the female boarder (Marie Polizzano). When it’s apparent that she’s sleeping with a young turk, actually named Turk, everything goes to hell in a hand basket. Is there any hope for Mary and Ben in “Detroit”? Or Lola and Doc in “Sheba”? You’ll have to see these two fine productions for yourself to find out. It’s hard, though, to come away from either of them without thinking that the ‘50s model of women living their lives through men was and is a dead end. It’s also worth noting that the two productions represent a nice ecology that wasn’t always present in Boston theater. Adrianne Krstanasky first attracted notice in small, adventurous theater – think “Bug” at the Boston Center for the Arts theater next to the Calderwood, where “Sheba” takes place — and now she has a major role at the Huntington. That theater’s involvement with the Boston theater scene is a key part of keeping good actors in Boston. Maybe Becca A. Lewis or Courtland Jones will be calling for the lost dog, Sheba, in the next Huntington revival of the Inge play. Scenes from other productions of "Detroit" with, among others, Laurie Metcalf and Amy Ryan. Lisa D'Amour talks to the National Theatre about "Detroit." 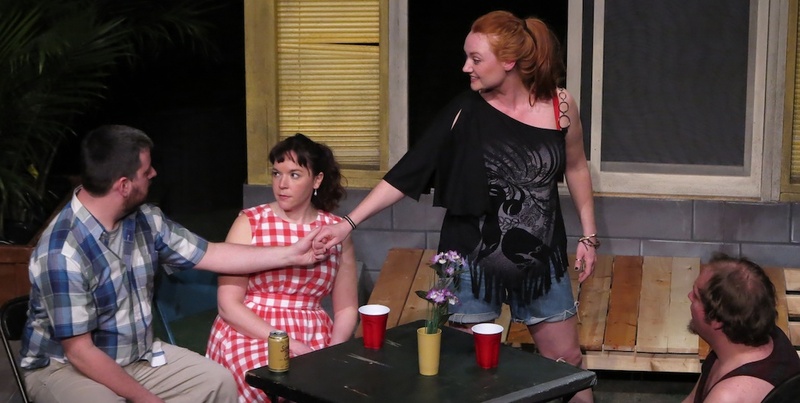 The Huntington Theatre Company's production of "Come Back, Little Sheba."